Here are some frequently asked questions about the 2018 tax statement. How will I receive my year end statement? Statements were emailed out the week of January 28th. If the church did not have an email address then statements were mailed the week of January 28th. How can I read my statement? Please see the SAMPLE statement below. Why are each of my contributions not itemized? This occurred when any 2018 contributions were made on the prior platform. Contributions made in the prior platform are found in a lump on your statement by fund. 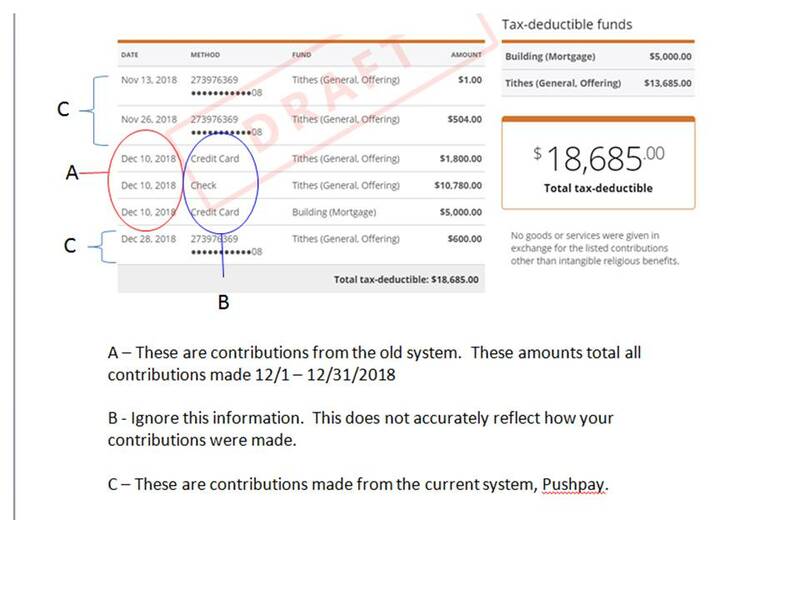 These contributions are also identified with the date 12/10/18. If you would need an itemized account statement please contact the church. Are all 2018 gifts included in my giving statement? Yes! Contributions made from 1/1/2018 through 12/31/2018 are included from both giving platforms. If you only used one of the giving platforms in 2018 all information is included in the statement. I didn’t give contributions by Credit Card. Why does it say this? Contributions that were imported from the prior platform have Method information that is not accurate. Please ignore the Method for contributions imported on 12/10/18. My husband and I both give to the church. Why does the giving statement only have one name listed? Our new giving platform provider combined all contributions for a household into one statement. Unfortunately, only one name is listed on the statement. We are working with the new provider to correct this for the following year. Why did the church change giving platforms? In the long run, the new platform will be easier to give. Who can I contact if I have questions on my giving statement? We recently upgraded our giving platform to make giving easier and more secure. If you are currently giving or have recurring giving set up, then you can move to the new platform by clicking the Give Now button below. Do you have recurring or scheduled giving set up on our old platform? STEP 1: ADD your recurring giving profile to the new giving platform. STEP 2: CANCEL your recurring giving profile in the old giving platform. Log in at ACS Giving / Partner, under the “Giving” header select “My Scheduled Giving”; on the right side of your gift click the red X to delete the gift, select “Confirm Delete”. If you have questions or need help, please contact us at 515-965-1737 x218 or email us. We can quickly help you move to the new platform.